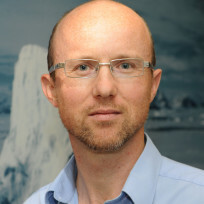 Dr. Kevin A. Hughes is the Environmental Research and Monitoring Manager at the British Antarctic Survey (BAS). He is a member of the UK Delegation to the Antarctic Treaty Consultative Meeting (ATCM), Vice-Chair of the Committee for Environmental Protection (CEP) and Convenor of the Subsidiary Group on Climate Change Response (SGCCR). Within the context of the Antarctic, he has broad science and policy interests including conservation, geological heritage, area protection, non-native species, environmental impact assessment, bioprospecting, environmental monitoring and the expansion of human footprint. He has visited the polar regions 11 times, including one Antarctic winter. Dawson, Jackie, Hoke, Winfried, Larners, Machiel, Liggett, Daniela, Ljubicic, Gita, Mills, Brian, Stewart, Emma, Thoman, Rick, Atkinson, David, Hughes, Kevin, Knol, Maaike, Wilson, Katherine. (2017) Navigating weather, water, ice and climate change information for safe polar mobilities. Geneva, World Meteorological Organization, 84 pp. (WWRP/PPP, 5). Stark, Jonathan S., Conlan, Kathleen E., Hughes, Kevin A., Kim, Stacy, Martins, Cesar C.. (2016) Sources, dispersal and impacts of wastewater in Antarctica. Antarctic Environments Portal. Hughes, Kevin A., Frenot, Yves. (2016) Status of known non-native species introductions and impacts. Antarctic Environments Portal. Hughes, Kevin A., Convey, Peter. (2014) Non-native species in Antarctic terrestrial environments: the impacts of climate change and human activity. In: Invasive species and global climate change, CABI, 81-100. Hughes, Kevin, Oliver, Jamie. ; Rodger, Alan, Shears, John, Culshaw, Robert, Bowman, Rob (eds.). (2009) Understanding Antarctica – 50 years of British Scientific Monitoring (1959-2009). Cambridge, British Antarctic Survey, 20 pp. Hughes, K.A., Ott, S., Bölter, M., Convey, P.. (2006) Colonisation processes. In: Trends in Antarctic terrestrial and limnetic ecosystems: Antarctica as a global indicator, Dordrecht, Springer, 35-54. Hughes, Kevin A.. (2006) Accidental transfer into Antarctica of alien species with soil on construction vehicles. Aliens, 23. 8-10. Hughes, K.A., McCartney, H.A., Lachlan-Cope, T.A., Pearce, D.A. (2004) A preliminary study of airborne microbial biodiversity over peninsular Antarctica. Cellular and Molecular Biology, 50. 537-542.